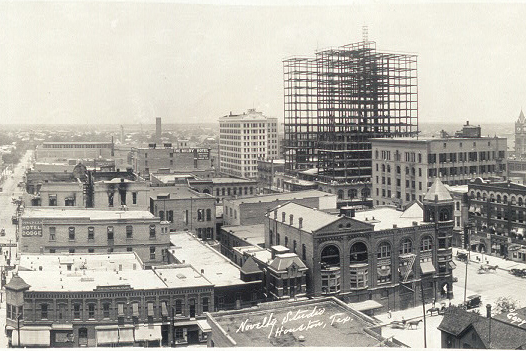 Detail of “Bird eye view of Houston,” Tex., June 22, 1912, Novelty Studios Houston, Texas, Panoramic photographs, Library of Congress Prints and Photographs Division Washington, D.C. 20540 USA. This fall when the Glasscock School completes its three-session series of courses celebrating Rice’s Centennial, it will do so with an appropriate look back at Houston 100 years ago – the year of the university’s founding. While 100 years is a momentous achievement for a university, it is also a major period in the life of a city, especially one as young as Houston. We don’t often think of cities as young, but consider that when Rice first opened its doors on October 12, 1912, Houston had still not yet seen its 100th anniversary. Still, at only 76 years old, the city was already showing several signs of hallmarks of the city today, such as rapid growth, leadership roles in numerous industries (including the new, booming oil business), and a great entrepreneurial spirit in the arts, sports and other leisure pursuits. With a metropolitan area already home to between 115,000 and 125,000 people and boasting 40 skyscrapers between six and 18 stories, the city was also the greatest railroad center in the South, with 17 rail lines and hundreds of passenger trains running through the city every day. Its new, 7,500 seat city auditorium hosted 10 concerts by The Russian Symphony Orchestra and a run of the opera, “Parsifal,” performed by the Full Metropolitan Opera and Orchestra. Led by Houston historians Betty Trapp Chapman, Jim Parsons and Mike Vance – favorite lecturers in many previous Continuing Studies courses on the Bayou City – “Houston 100 Years Ago: The Setting for the Rice Institute” will examine a number of entertaining facets of the city at that time. Classes begin on Tuesday, October 2.